One-year space station crewmembers Scott Kelly of NASA (left) and Mikhail Kornienko of Roscosmos (right) talk to reporters in April 2015. On July 8, Time magazine posted the first two episodes in a 10-part documentary Web series following NASA astronaut Scott Kelly's unprecedented yearlong space mission. The documentary, which will be released in stages throughout the 12 months Kelly and cosmonaut Mikhail Kornienko are spending aboard the International Space Station, offers an inside look not only into the mission, but also into Kelly's life as an astronaut. You can watch the documentary Web series here: http://time.com/space-nasa-scott-kelly-mission/. The first two episodes, which run about 13 minutes each, document the days leading up to Kelly and Kornienko's March 27 launch. We get a picture of Kelly's excitement and reservations — and those of his family, as the astronaut's girlfriend and two daughters prepare to say goodbye. 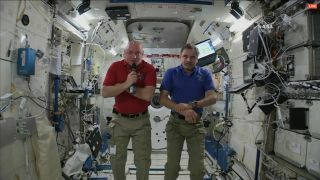 As of today (July 31), Kelly and Kornienko have spent 125 days aboard the space st. But it isn't just the length of the mission that makes this year in space special: Kelly will also be one part of perhaps the most accurate test to date of how long-duration spaceflight affects the human body. The other part of that experiment comes from Mark Kelly, Scott’s identical twin brother and a former NASA astronaut. Throughout the mission — which NASA officials say will help lay the foundation for crewed trips to Mars — Mark and Scott are both being monitored by doctors who will look for changes in Scott’s physiology and genetics as compared to Mark. "Giving urine and stool samples is an incredibly exciting thing to do," Mark jokingly told Time. Following the Kelly twins and their family through Scott’s year in space wasn’t Time's original plan. "It really started off as a print story," Jonathan Woods, Time's senior multimedia editor, told Adweek. "We went down to NASA [in early December] and scrambled to get a spacesuit for our cover shoot." Scott and Mark Kelly graced the cover of Time in December, three months before Scott left home. But when he was sitting in Scott Kelly's living room to work on that cover story, Woods realized the yearlong space mission was about much more than Scott Kelly’s work on the International Space Station — and worth more than a few pages in the magazine. Thus, Time’s "A Year In Space" documentary was born. Instead of a cold, hard look at the science of Scott’s mission, Time representatives say, the documentary tells the "truly moving, truly human tale" of Scott, Mark, and the way their time in space impacts not only their family, but also the world. Follow Kasandra Brabaw on twitter at @KassieBrabaw. Follow us @Spacedotcom, Facebook and Google+. Originally published on Space.com.